Aragon identifies Hot Vendors in Blockchain, Customer Journey Mapping, Intelligent Contact Center, and Learning. Aragon Research publishes Hot Vendors Part III. While blockchain has the potential to revolutionize Smart Contracts over the next several years, enterprises can reap benefits from leveraging Customer Journey Mapping, Intelligent Contact Center, and Modern Learning today. 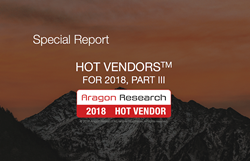 In its latest Hot Vendor reports, Aragon Research Inc. identifies noteworthy, visionary, and innovative vendors in four markets: Blockchain, Customer Journey Mapping, Intelligent Contact Center, and Learning. Providers in each of these reports are helping to improve customer and employee journeys with their technology offerings. Because it acts as the primary interface between enterprises and their customers, the impact of Contact Centers on the customer journey is profound. Aragon identifies three Hot Vendors adding modern AI technologies to current Contact Center functions and workflow to improve the customer sales and support journeys. Last but not least is the employee journey, and Aragon identifies five Hot Vendors in Learning helping to drive active employee learning and engagement during the onboarding process and beyond with cloud-based platforms. Aragon clients can learn more about these providers by reading the Special Report: Aragon Research Hot Vendors for 2018 Part III.